As we approach the northern hemisphere's summer solstice (June 21), news has emerged of a clever and eye-catching initiative from Skoda. 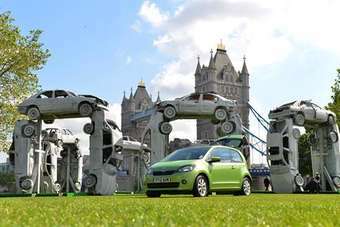 The company has installed a replica of Wiltshire’s iconic Stonehenge - made entirely from recycled car parts - on London’s Southbank. The art work has been specially commissioned to celebrate the launch of the Skoda Citigo (Skoda's up!). The build will be in position on the Southbank on 19 and 20 June, so catch it today if you are in London (personally, I would like to know what cars are being used in it...). Citihenge, led by sculptor Tommy Gun (look, he's not going to be called John Smith is he? ), took a design team three months to create. The ambitious piece of art, built using 18 scrap cars, stands at over five metres tall. Each henge is five metres wide and the commanding structure weighs a remarkable 36 tonnes. The beacon of economical motoring will remain at Potters Fields for two days before touring the UK, with a move to the Goodwood Festival of Speed and its celebration of car culture, in West Sussex from 28th June – 1st July. As far as I can tell, Citibank (loudly celebrating its 200th anniversary) is not involved in this project, though I bet someone from there will wish they had had a similar idea. As for the real Stonehenge, tomorrow will see thousands, led by latter day 'druids' converge for the traditional summer solstice sunrise party. Alas, the weather appears – as is also traditional here - not to be playing ball. Today will see sunshine and warm temperatures in southern England, but rain is moving in for tomorrow morning. Hang on a sec. 'Citihenge will be in position on June 19 and 20'. But the solstice is on June 21 isn't it? It is still a good idea, but I wonder if Skoda's date plans were knocked out for some reason. 1.The structure is engineered to withstand force 12 hurricane winds. 2.36 tonnes of steel used in the structure (including the cars). 3.The entire structure weighs 30 tonnes. 4.The accumulative mileage of the cars used in the structure is 1.9 million. 5.The structure was erected on site in London in less than 12 hours. 6.The Citihenge structure is 100% recyclable.